Make this Chimichurri Sauce Recipe at home and abandon store-bought versions. 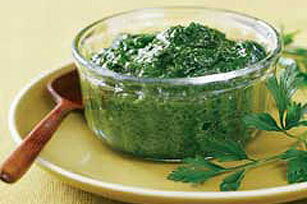 One taste and you'll know why this Chimichurri Sauce Recipe is the way to go. Place all ingredients in blender container; cover. Process until well blended. Serve over grilled steak, pork or chicken. Add 1/2 tsp. crushed red pepper or a seeded and chopped fresh jalapeño pepper to the sauce for extra heat. Visual: Entire steak on a platter with sauce in small bowl on side and sauce drizzled on top of meat.